Nitro Internet Proxy Accelerator compresses data before it is delivered to you. By connecting to one of our many proxy servers in Asia and the US, not only can you get faster internet access but you can get access to all of the internet without restriction. Using Nitro Internet Proxy Accelerator, our average compression ratio for http traffic is 4:1. 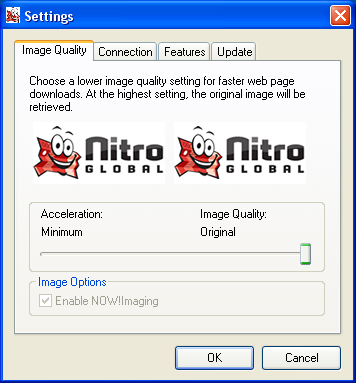 Nitro Proxy compresses data before it is delivered to you. Alternatively, they slow you down so it's almost unusable. With Nitro, you will be able to surf up to 4 times as many web pages before you reach your limit! Faster Internet - for many people, dial up, ISDN or slow wireless is all they can get or afford. By compressing your data, Nitro can give you as much as 19 x faster service. However, on average it is more like a 4 x improvement. Nitro Proxy compresses data before it is delivered to you. By connecting to one of our many proxy server in Asia and the US, not only can you get faster internet access but you will start reducing excess data fees immediately. Qweas is providing links to Nitro 6.0.30 as a courtesy, and makes no representations regarding Nitro or any other applications or any information related thereto. Any questions, complaints or claims regarding this application Nitro 6.0.30 must be directed to the appropriate software vendor. You may click the publisher link of Nitro on the top of this page to get more details about the vendor.